Have Some Fun Team Building and Networking! Looking for a great way to spend a Friday morning? Bowling For Business is perfect for taking a much needed break from work, fostering team building among your employees and getting some exercise while you're at it. It's also a wonderful opportunity for those in your office who don't golf or have a extra few hours to "spare" to network for new business contacts and leads. 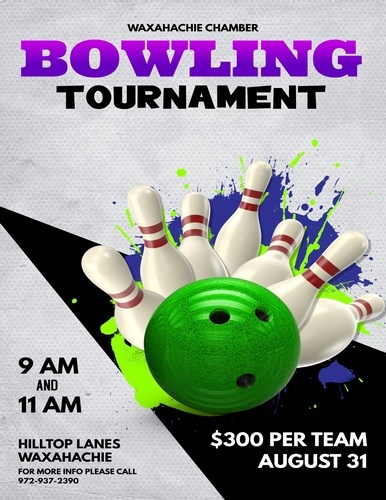 Design Your Bowling Team's Shirt | Win Prizes! We also invite you to design your bowling team shirts. Get creative, go wild and show your team spirit in a unique way. Prizes awarded during the day include highest and lowest team scores and best team shirt design! Email vmartinelli@waxahachiechamber.com for information on the various sponsorships available.